The superstar entrepreneurs you love to follow for success tips and to view their successful lifestyle worked hard to earn the life they live today. Their success was achieved through years of hard work, sacrifice, and remaining focused on building their businesses. But you did not learn about these entrepreneurs until after their success was achieved. Once entrepreneurs have earned success and built a multi-million dollar business or businesses, they then begin to seek attention to build their personal brand as another stream of income. They write books, create shows, do speaking engagements, and are constantly promoting both themselves and their businesses. The majority of successful entrepreneurs do not bring the spotlight to themselves during their journey to success. This is quite reasonable because you do not want to claim to be something you are not — basically living a lie. This why you do not believe you should not waste time building your personal brand. Who are you? What have you achieved that could possibly inspire people? Maybe you are not a multi-millionaire entrepreneur yet. This does not mean you have to wait to start building your personal brand. You need for people to know how you are so they can grow with you and your business. Building your personal brand will actually help your business grow faster– if done correctly. 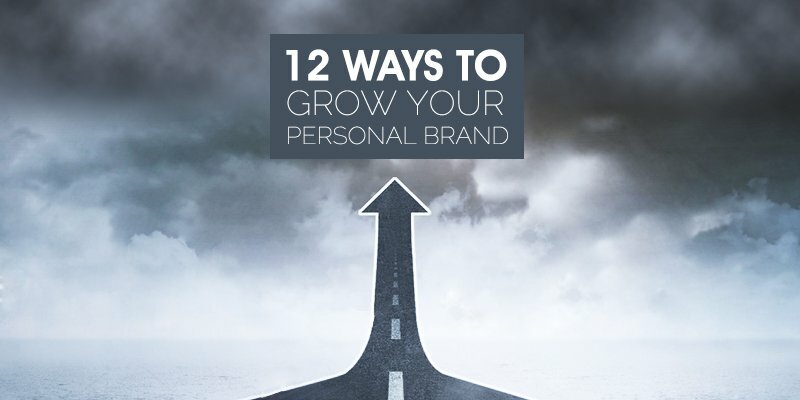 If you are ready to start building your personal brand, we have 12 ways that can help you as a brand gain more recognition. Read them and learn how you can turn your personal brand into a cash generating machine. You must become someone that other people want to follow. This means you need to become a superstar because superstars have the ability to become the center of attention that people gravitate towards. The way you become a superstar is by putting yourself front in the center so your target audience can learn who you are and what your business does. There are so many tools available today that allow you to develop your superstar persona. The key is learning how to leverage these tools to your advantage. Blogging, videos, and social media are all tools that provide you with the ability to transform your status of being unknown into having a growing number of fans and supporters. The best way to build your superstar status is by being honest — letting people know that you are taking them through your journey of success. Being authentic is the best way to gain people’s trust and admiration. Show them your small gains and demonstrate how they build up to produce big results. When people see you grow before their eyes they will become your most loyal supporters. Blogs and online videos are popular for a reason — people want to learn different information that can help them improve something within their personal life or professional life. As an entrepreneur, you possess some knowledge and information that people would want to know themselves. You have to provide this information to them so that they can come to recognize you as an expert in your particular field of work. Beyond being known as an expert, you want to be known as an authority. You need to write for top publications that cater to your target market since these opportunities will lead to you gaining exposure with people who are looking for your products and services. Writing for top publications also validates your position as an authority on your subject, which gives people assurance that you can help them with a particular situation or problem. Publishing is not something that you should do every other month or every other week. You will need to publish consistently if you want to gain a strong position as an authority who should be sought after for a certain specialty. Consistently publishing content will put you light years ahead of the competition because they are not putting out material to educate their target audience about who they are and the knowledge they possess. Great content is about sharing a story that engages people in an action packed show. You want to take people through an action-packed journey that keeps them excited and wanting more and more content. This is how popular online stars build their audience and keep it growing — by delivering content that people enjoy watching over and over again. Video platforms such as YouTube help you deliver content and basically build your own media company. You can direct people to follow you on YouTube for full blown videos, and provide them with teasers of your videos on places like Facebook, Instagram, and Snapchat. You will need to become your own promotional company, telling people about the value that is being provided through your content. The goal is to make your content a series that has many episodes with you being involved in different situations with different people. Even though your content is about you, it should not only feature you. You need to provide your audience with different people and environments so that they never become bored with your content. When they never know what they are getting, they will tune in for every new piece of video content you release. You need to publish your own ebooks, reports, and whitepapers so that people will look to you for information regarding an industry or specific information. This will help with your goal to be known as an authority. Authorities help people make decisions by providing them with high-quality information that is published by them. You will need to put out high-quality information and promote it as the newest, most up-to-date information that is available to your target market. This will help you build your personal brand, while also selling your products and services in the process. All the information you publish needs to be based on experience and facts. Never publish anything that is based on opinion — people (competitors) will try to poke holes in your information to prove you are a hack. Never settle for just putting out information once and expect to be able to ride on its success for years. Your competition wants the attention of same target market you are serving, so you will need to stay ahead of them by keep the people’s attention on your information. Consistently put out your high-quality information to keep your audience fed. Speaking is the best way to turn people attending in your audience into fans. They get to hear the knowledge and experience you have instead of just reading it. This adds personality to your information, which helps you build your fanbase quickly. There are multiple ways you can speak to your audience. This includes live speaking engagements, webinars, and videos. You want to be in front of your audience and engaging in conversations with them. Show your audience you understand their problems and take them through how a solution is produced based on your own experiences as a business owner and entrepreneur. Your speaking engagements are an opportunity to take your personal brand to another level because it gives you the ability to speak to a large group of people at one time. Superstar entrepreneurs love to speak in front of an audience. This is how they are able to sell a lot of their products and services at one time. Do not make the mistake of making your interactions with your audience strictly business. You need to move beyond speaking business facts and add a mix of personal touch to your engagement with your audience. This will help you keep you create a personal connection with your audience, which makes them loyal supporters. Communicate with your audience about your own personal struggles as an entrepreneur. Explain how you succeeded despite the obstacles you had to deal with. You also need to describe how difficult it is for an entrepreneur to sustain success once it has been earned. Sharing your personal stories will help people see that you are more than someone who is all about business. Show your audience that you work hard to provide for your family and to help other entrepreneurs succeed. Also, ask your audience to ask you questions so that you can provide them with answers via live feedback. Success is not completely earned if you are not living in a healthy body. Your health has just as much to do with your success as your business success. A healthy body helps you work harder and longer so that you can achieve more. If you are not healthy, you will eventually burn out and it will take a long time for you to recover. A healthy body also helps your mind think clearer. It is hard for you to think with a clear head when your mind is polluted with toxic chemicals that make you depressed and anxious. You get these things out of your system by working out and eating healthy. When you look good and feel good, you will operate at a higher level. You will also gain more confidence, which will help you seek bigger opportunities and want to be in front of people. Just being healthy can take your business to another level. Building your brand is an ongoing process. The job of building your brand is never a job that is complete. Even when you have a built a huge following, you will need to continue to engage them with daily updates in the form of shareable content. You want to make this content shareable so that it can be shared with other people, growing your fanbase in the process. Getting in front of your audience does not simply mean that you write a one line update on your social media pages every day. You need to actually engage with your audience on a daily basis. This can be done via Facebook, email marketing, YouTube, Instagram, Snapchat; you have a long list of options to achieve this initiative. This is important to do because your competitors are after the same audience you are engaging with. If you are not communicating with your audience on a consistent basis, then your competitors surely will be communicating with them. Never allow your audience to forget you and your value because you believed you have earned their undying loyalty. This is never the case in a world where people are blasted with tons of information on a daily basis. Facebook Live is a perfect tool for communicating with your audience on a daily basis. You can take people through your life, showing them the daily routines and activities you engage in on a daily basis. This will help you develop fans that are actively engaged with your personal brand. You do not want to just put out videos that are just full of information that is more annoying than helpful. Annoying information will just turn off people because you seem to be more narcissistic than sincere. These are the type of people who make Facebook Live videos talking about what they ate, or sharing their opinion about something that no one cares about. Set out to help people through your Facebook Live videos. Share information with them that will help them overcome challenges and obstacles. You want to be people’s daily source of information and motivation. People will then be looking forward to tuning into your videos when they see that you are on live. The moment you stop making improvements is the moment you and your business will fail. If you are not focused on constant improvement then you are not focused on being excellent. The most successful people are always trying to improve themselves so that they never feel the sting of mediocrity. No matter if you are successful, you are never at a level where your success is secured. You have to constantly push yourself to reach a higher level so that you make your competitive advantage hard to compete against. Nothing scares your competition more than when they see that your business continues to grow and improve. If you are a great salesperson, try to improve the number of sales you do per month or increase the dollar amount of your sales. Maybe you want to do a certain number of speaking engagements or write a best-selling book. Set a goal and work towards it because this goal will force you to improve your performance. As a successful entrepreneur, you are very busy, making it hard for you to remain focused on building your personal brand. But this is not an excuse to neglect your personal brand. If you do so, it will make it hard for you to differentiate yourself from your competition. Your Brand building systems are things like your blog, speaking engagements, and videos. You need to provide valuable information through these platforms to keep your brand alive and growing. Provide a call-to-action through each of these platforms that direct people to subscribe to your email list or sign up for a new class you are offering. The best system is one that is automated. You want the system to keep flowing without You having to be constantly involved. This way your personal brand is continuing to grow, while you are working on growing your business. You do not just want casual fans to follow you. You need people who are loyal to your brand and are eager to see you successful. These are the people who tell others about why they should be following you. You create loyal followed by helping people become successful. When you help others succeed, they are forever grateful for you changing their life. You did not just take their money and provide mediocre results. You instead used their money as an investment to produce their growth. Loyal followers are not something that can be bought. You have to earn the loyalty of these people through hard work and proven results. It does not matter how great you are if people cannot verify the value you provide. Building your personal brand is never ending process. You will find it hard to build your brand with sporadic activity and no real strategy in place. If you want to be known as a superstar entrepreneur, your personal brand will need to signify that you have superstar status. This means being everywhere your audience is and engaging them with valuable information. Your blog, videos, and speaking engagements all need to be planned out to achieve a bigger goal and not just a single act. Think of your personal brand as a long-term strategy that will take you and your business to another level of success. Asiabiz offers a suite of business and advisory solutions to help your run your business.